I have been trying out a bit of origami. You see, the delightful Jay of Finki is hosting a monthly design challenge. The aim is to create a project to a monthly theme, using your own medium and interpretation. "Japanese" was the theme selected for the first month. Its not a particularly original contribution, but I really wanted to try origami. I have never had any success with the art of paper folding. Flowers and cranes have baffled me; paper airplanes have plummeted to the ground. Paper is not my friend. I chose a very simply project - a traditional little origami box called a Masu box. I began by interfacing a square and pinking the edges, so that it wouldn't fray. Then I got to work using the excellent diagrams at www.origami-instructions.com. To start, I folded the square in half in both directions. I used my trusty iron to press nice crisp folds. Next I folded the points in and pressed the folds again. Then brought the top and bottom edges to the middle. Followed by the left and right edges to the middle. Then I pressed it all again. Following the instructions, I opened out the square, leaving just the points at the sides folded inward. The next bit was a little tricky - its a sort of squeeze-flip-fold manoevere, that I suspect is common to all beautiful origami. You know ... all in the wrist action. My squeeze-flip-fold technique was a bit flawed, so this side of my Masu box is a little bit wonky. I repeated the manoeuvre on the remaining side of the box. With thanks to Jay, for hosting this challenge. To see some absolutely beautiful Japanese-inspired projects - including collage, sewing and jewellry-making - head over here. We love those origami boxes. My eldest made them at school and bought the pattern home. Last year I made fabric origami boxes by ironing interfacing onto the fabric and folding them exactly the same. A quick dab with the iron to secure the folds in place, and bob's your uncle. That is very cool. Very, very cool! We love those little boxes too. Over the holidays my 9 year old made heaps of them each smaller than the next so they all fitted inside each other. 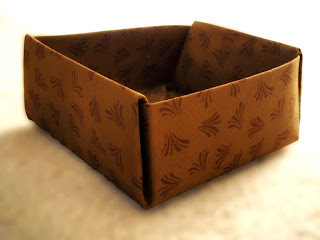 I am definitely going to try Jo's fabric boxes soon. I have to confess to having made the same thing, more than once, from.... Post-It Notes. Liesel that is just gorgeous, I just love it. I'm a bit the same with paper and folding, but I like the fabric origami even better. Using fabric for origami.... who'da thought? Looks great Liesl, even filled with headless men! This is so cute, I wouldn't of thought of fabric either - I suspect we could have 1000 fabric cranes soon???? I am a origami lover and I love this idea of an origami box, I will make it and put some little origami figures there, thanks for sharing!